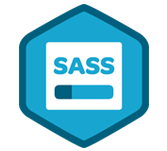 SASS (Syntactically Awesome Stylesheet) is a CSS pre-processor, which helps to reduce repetition with CSS and saves time. It is more stable and powerful CSS extension language that describes the style of document structurally. Who are the audience of SaaS? This tutorial will help both students as well as professionals, who want to make their websites or personal blogs more attractive. What are the prerequisites of SaaS? How to develop simple Web Pages using HTML or XHTML.